Imagine if the public discovered that a small group of surgeons had invented something—a device that could save the lives of women and babies—but had kept this device a closely guarded secret for more than a hundred years. Such a thing would now be considered highly unethical, but it’s exactly what happened with the invention of the obstetric forceps, which are still occasionally used today to help a woman deliver when her labor has stalled. The group in question was the Chamberlens, several generations of a family of surgeons and accoucheurs—male midwives—who worked in England from the late 1500s through the early 1700s. Obstetric forceps look like a cross between salad tongs and a tool for pulling very large teeth, but they have saved a lot of lives. They’re used to help guide the baby’s head through the birth canal and gently pull while the mother pushes. In the days before anesthesia, sterile technique, and antibiotics, when performing a cesarean generally meant killing the mother, they were a breakthrough. In centuries past, starvation and nutritional diseases like rickets made women more likely to have small or malformed pelvises, which meant that babies were more likely to have difficulty getting through a birth canal that was too small for their heads. Before cesarean sections, a woman with a difficult delivery might be in labor for days. Often, after days of obstructed labor, the baby was dead and the mother might be dying. Midwives carried sharp hooks that could be used to dismember a dead baby so that it could be delivered in pieces—a grisly process, but one that gave the mother a chance to survive. The Chamberlen family history starts with William Chamberlen, a French Protestant surgeon who fled religious persecution and arrived in England in 1569. He had two sons, both named Peter, who followed his footsteps into surgery and his specialty of delivering babies in difficult cases. The older Peter is thought to have invented the forceps in the late 1500s or early 1600s, but the precise origin is unclear—the inventor actually could have been either Peter. Both Peter the Elder and Peter the Younger, as they were called, used the forceps to help deliver babies. They kept the device to themselves, employing a bit of showmanship and an insistence on total secrecy. When either of the Chamberlens was summoned to a difficult delivery, they were accompanied by a large, ornately carved, gilded box carried by two men. Everyone else was ordered out of the room and the laboring woman was blindfolded before the box was opened and the forceps (18 to 20 inches long or so) were taken out. Often, those outside the room reported hearing mysterious noises and bells accompanying the moans of the woman in labor. The whole process usually ended with either the cry of a newborn or the news that although the baby had been stillborn, the mother still lived. Both Peters used the forceps for many years. Peter the Younger had a son named Peter, who followed in the family trade and who also used the secret device. This Peter Chamberlen had a son named Hugh, who also practiced obstetrics with the large mysterious box. In 1670, Hugh Chamberlen tried to sell the secret of the forceps to the French, who asked him to demonstrate on a woman—a dwarf with a malformed pelvis who had been in labor for eight days. That delivery did not end well, and Hugh headed back to England with his tail between his legs; the forceps remained a secret. Why did the Chamberlens keep the forceps so hidden? According to the Royal College of Obstetricians and Gynaecologists, there was opposition at that time in the medical and surgical establishments to using such devices in childbirth, which were considered “meddlesome midwifery” and could cause serious injury to mother. There was also a financial incentive, of course; a lot of money could be earned by being the people who could deliver a baby when no one else could. But by the early 1700s, the secret of the forceps had slipped out and other obstetricians seem to have been coming up with the idea on their own. 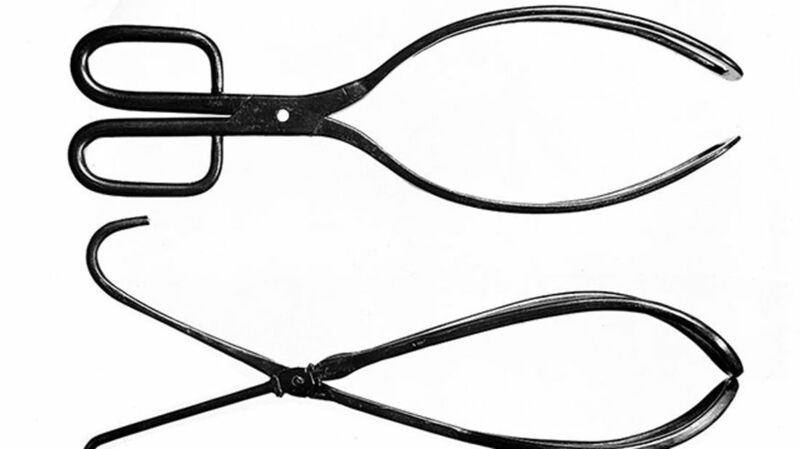 Since then, dozens of improvements on the Chamberlen forceps have been devised, but the use of forceps started declining when advances in anesthesia and more sterile technique made cesarean sections a safer and faster way to deliver a baby in a difficult childbirth. Today, less than 1 percent of babies are born in the United States with an assist from forceps, according to the National Center for Health Statistics. The Chamberlen forceps were such a secret that they remained hidden even after others had started using similar tools. So what happened to the originals? In Essex, England in 1813, the owners of a house where the Chamberlen family once lived found a box hidden in a compartment in the attic. Inside the box were some coins, a miniature portrait of one of the Peters, and several pairs of the Chamberlens’ obstetric forceps. The forceps are now in the collection of the Royal College of Obstetricians and Gynaecologists in London. They are on display in the college’s museum, which is open to visitors by appointment.